Two-time World Boxing Council (WBC) welterweight champion Charles Manyuchi says he is quitting boxing at the end of this year in protest over Zimbabwe’s lack of appreciation of his exploits. In an exclusive interview with Standardsport, last week Manyuchi said: “I think if I was related to a government minister or member of parliament I was going to meet the President like what Kirsty Coventry, Stephen Muzhingi, Elliot Mujaji and Munyaradzi Chidzonga did,” said Manyuchi. “God has never failed me because I have made Zimbabwe proud even though they do not appreciate my efforts. I am spreading the gospel through boxing. Manyuchi is under Zambian stable Oriental Quarries Boxing Promotions, who fully cater for his training with no help coming from the Zimbabwean government. The 26-year-old pugilist successfully defended the WBC international welterweight title last November after claiming a third round victory over Devis Caceres of Colombia at the Government Complex in Lusaka, Zambia. He had earlier on in March won the same title after beating respected Ghanaian Patrick Allotey at the same venue. 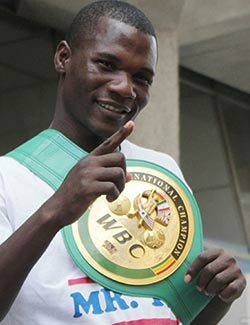 After several victories on foreign soil including in Burkina Faso, South Africa and Namibia, the Masvingo-born boxer has always complained about the Zimbabwean government’s blind eye on his achievements. He was however, finally honoured last month when he was named the country’s 2014 Sportsperson of the Year. But he is still disgruntled and says the time is up for him to hang his gloves. In his next fight, he is expected to trade leather with a yet to be confirmed Equatorial Guinean on February 5. The fight will be in Bata for the vacant IBF Inter-Continental welterweight title. Manyuchi has already started training in Zambia and has never staged an international bout in Zimbabwe.